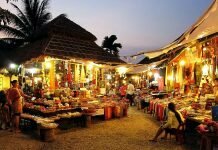 The first stop during the trip we want to introduce to you is Sihanoukville. Famous for many beautiful beaches but two of the most stunning beaches in the province are Ochheuteal Beach and Serendipity Beach. Visitors can spend 2 days in here so you should book the hotel surrounding this area to be more convenient in moving. If you travel in the summer, it is the best to book in advance because it is the peak season, the hotel may run out of room. 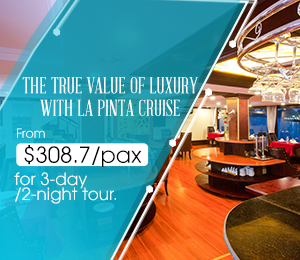 Known as one of the most attractive destinations in Cambodia with long beaches, clear waters and full of facilities like bars, cinemas, restaurants,… travelers can freely relax, try exciting nightlife experiences. In the next morning, you buy the boat ticket to reach the paradise Koh Rong Samloem. The boat departs at 8am and returns around 4pm. 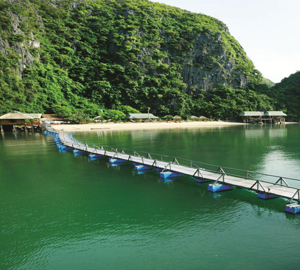 You also can stay overnight in the island and turn back in the early morning next day. After two days in Sihanoukville, you can take the night bus to Siem Reap in the next morning and continue your journey discovering Cambodia. 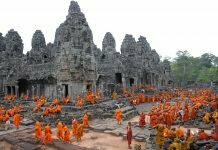 Visitors will have the opportunity to visit the ancient temples with unique beauty and architecture at Angkor temple complex. With an area of about 200 hectares, Angkor Wat is one of the largest religious monuments in the world. Originally built as a Hindu temple dedicated to the god Vishnu, it was converted into a Buddhist temple in the 14th century, and statues of Buddha were added to its already rich artwork. The central tower is surrounded by four smaller towers and a series of enclosure walls, a layout that recreates the image of Mount Meru, a legendary place in Hindu mythology that is said to lie beyond the Himalayas and be the home of the gods. The best way to reach Angkor Wat from the city center is taking a tuk tuk. This is also an ideal place to watch the romantic sunrise and sunset. Besides Angkor Wat, Banteay Srei temple is also very interesting place that you should not miss. Then, continuing to move to Kbal Spean – a very famous tourist destination in Cambodia. This is an intricately carved riverbed deep in the foothills of the Cambodian jungle. Lingams are phallic representations sacred to Brahmanism as symbols of fertility, and hundreds of them are carved into the rock here, as are several carvings of gods and animals above the small waterfall. The best time to visit Kbal Spean is from July to December, at other times of year the river rapidly dries up. From Siem Reap, it takes about 6 hours to reach Phnom Penh. To discover Phnom Penh, you can hire a tuk tuk to visit the famous attractions in the city such as Wat Phnom or Tuol Sleng Genocide Museum, Royal Palace, Central Market, etc. At night, you can take a walk around the night markets to visit, enjoy local cuisine as well as buy the beautiful souvenirs to take back for friends and family. 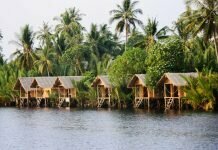 Cambodia offers a lot of interesting experiences, we hope that these suggestions will help you have the most suitable itinerary for your trip. For more Cambodia travel guides, you can visit our website. Please let us know if you have any questions or further information. You can also share this article if you liked it!